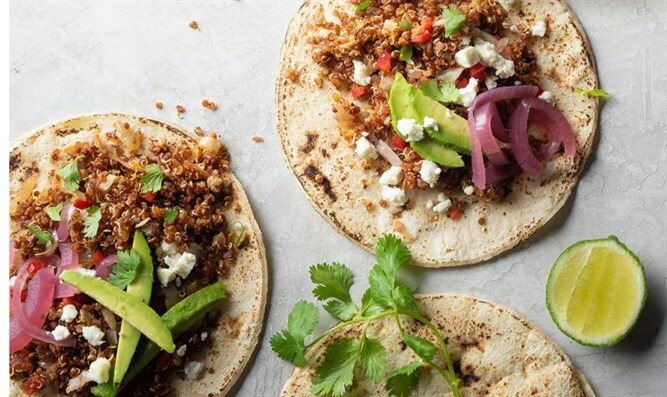 Tacos are an easy, fun food to prepare. You can top them, fold them, roll them, or fill them with just about anything. To make the filling: Heat olive oil in a medium-sized frying pan. Add the onion, garlic, leeks, celery, and carrot and sauté over low-medium heat for about 12 minutes, stirring frequently. Meanwhile, prepare the quinoa: Coat a small pot with olive oil cooking spray and heat over medium heat. Once hot, add rinsed quinoa and toast for about four minutes, stirring occasionally until fragrant. Add water and bring to a boil over medium-high heat. Reduce heat to low, cover with a lid, and cook for 15 minutes or until the liquid is completely absorbed. Add paprika and fluff with a fork. Open lid slightly and let rest. Preheat oven to 350 degrees Fahrenheit (180 degrees Celsius). Line a baking sheet with parchment paper and spray with olive oil cooking spray. Mix the quinoa with the salsa, spices, and sautéed veggies. Spread on the prepared baking sheet. Bake covered for 10 minutes and uncovered for an additional 15 minutes. Taste and adjust seasoning, if desired. To assemble, lay a taco on a plate (you can toast it first if desired). Top with a mound of quinoa. Sprinkle with grated feta cheese. Garnish with avocado or pickled onion if desired. Enjoy! If leeks aren’t available, use two onions. The taste will be somewhat compromised because leeks have a milder, more delicate flavor. You can substitute one teaspoon taco seasoning for the garlic and chili powder.